At Addison Internal Medicine, we strive to provide prompt, attentive care to every patient. To help our internal medicine doctors provide treatment when you need it, we added a physician assistant to our team. 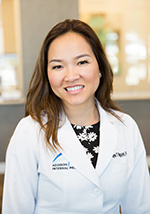 Uyen Nguyen, PA-C, is a certified physician assistant trained in the field of general medicine and preventive care services. She has the experience and expertise to care for our patients properly. Uyen received her Master of Physician Assistant studies from Mississippi College. She earned her bachelor’s degree in biology from the University of Texas at Austin and holds a master’s degree in biology and medical sciences. She is originally from the Dallas area and spends much of her free time cooking, sampling different cuisines, cheering for the Texas Longhorns and attending concerts. Like others in her chosen field, Uyen is a fully trained and certified health care professional. Much like a general practitioner, a physician assistant (P.A.) is educated to be uniquely flexible and responsive to a wide variety of medical conditions. Her talent and training extends the capacity of our team of doctors at Addison Internal Medicine, making it easier for patients to get the outstanding level of attentive care they have come to expect from us. To schedule an appointment with our physician assistant or one of our internists, contact us online or call us at 972-733-3090. Can Super Foods Improve Your Health?